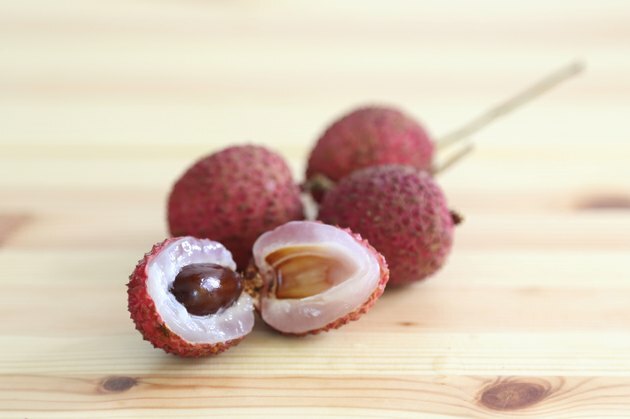 Lychee is a sweet and tasty strawberry-red fruit that is a symbol of love and romance in China. As the University of Purdue horticulture website explains, lychee grow in clusters on trees and usually have a round or oval shape. Lychee fruit is roughly one 1 inch long and 1 inch wide. To get at the fruit, you peel off a leather-like skin. The fruit surrounds a rather large seed in the middle. A few days after the fruit ripens, it turns dark and dehydrates, resembling a raisin. The firmness of the shell of the dried fruit has led some people to label lychee fruit as "litchi nuts." However, as the Purdue website emphasizes, "it is definitely not a nut and the seed is inedible." Although the seed may be inedible, powdered seeds or tea made from lychee seeds are used for medicinal purposes, although actual health benefits seem to be more anecdotal than clinical. The seeds of lychee fruit are purported to have pain-relieving properties. It is traditionally drunk as a tea made from powdered seeds. People in Northern India have long used powdered lychee seeds for digestive disorders. It is also used to kill intestinal worms. However, few, if any, research studies confirm the effectiveness of lychee fruit seeds for medicinal purposes. While powdered lychee seeds may have some health benefits, eating the seed itself is a bad idea. As the Helium website explains, "not only does [the seed] taste bad, but it can have some particularly unpleasant effects on your digestive system." While the seeds of lychee fruit may have limited health benefits, the rest of the fruit appears to be quite beneficial. From a nutritional standpoint, lychee fruit is low in calories, high in fiber, high in vitamin B complex and vitamin C and loaded with minerals such as potassium. In terms of direct health benefits, lychee is used for coughs, upset stomach diarrhea and gland problems. The peel of the skin is used to fight viruses. In a study by the USDA and National Cancer Institute, lychee roots showed some effectiveness against one type of tumor in tests on animals.